A geometric pattern brings a modern flair to this ancient symbol of Christianity. This cross pendant from Apples of Gold is wrought of 14K yellow gold for traditional base, but the design is simple and modern. The gold cross pendant features a pattern of circles inside squares that creates a mesmerizing grid across the entire pendant. The clean lines and expert craftsmanship make this Apples of Gold creation a pendant of excellent style that beautifully honors the Christian faith. 18mm x 12mm (3/4" x 1/2"). 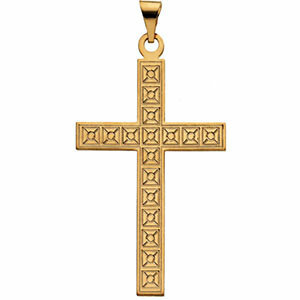 We guarantee our Small Geometric Cross Pendant in 14K Gold to be high quality, authentic jewelry, as described above.